We repeatedly took him to the doctors – it seems he had constipation. We were told he was ok and to carry on giving him his milk. When he started to eat solids we gave him fruit, veg and high fibre foods but he still remained constipated. Eventually, at 15 months, he was prescribed a laxative and he seemed to improve. At 16 months, in August 2015, we rushed Sebastian to A&E as he had a considerable amount of blood in his urine. They took blood and a urine sample and sent us home the next day saying his bloods were not normal and he had a urine infection. We were told to return two days later and to continue to test his urine. On our return we were told that these tests indicated blood and protein in his urine. They took a blood sample, after a number of attempts, for testing. Sebastian was in pain and seemed to be straining. An hour later we were told the blood taken could not be tested and, because they had tried so many times to take blood, his veins needed time to recover. We needed to return in a week. A week passed and still his urine was showing blood and protein in it. He was in pain when he passed urine or did a poo. At the hospital a phlebotomist took his blood within a few seconds. A few days later Sebastian had a prolapsed bowel because he was straining so badly. We went straight to A&E and were sent home with more laxatives. I tried to explain he had diarrhoea, but they said he would be fine. A week later the consultant told us that Sebastian was okay. His blood levels had gone down and he was straining because he was reluctant to poo since it had been so difficult for him in the past. We were due to go on holiday and were told he could go. Whilst on holiday Sebastian started to be in extreme pain and just cried in agony. We called the travel agent at 5am and they got us on a flight. We went straight to A&E and told them about Sebastian’s pain and his inability to wee and poo. They eventually examined his bowel internally and said it was fine, but that his bladder was enlarged. They booked us in for a scan the next day. Sebastian was in so much pain he could not eat or sleep. The hospital rang to tell us the ultrasound scan was delayed by a day. When I explained Sebastian’s pain they said there was nothing they could do. I took him straight to A&E. After examining him again they said we could go home. We refused to leave until the ultrasound was done and we knew he was ok. He had the ultrasound that afternoon. My partner and I were watching – we saw a growth in his bladder. The consultants sat us down and confirmed it was a tumour. They got us a bed on the ward. After three days we were moved to another hospital where Sebastian had an operation to fit a catheter and port. He also had a biopsy and a camera inserted to investigate what was going on in his tiny body. He went through a number of scans, heart echoes, and X-rays. He refused to take his meds and it was a daily struggle to get him to take his painkillers. He was in more and more pain and it was heartbreaking to see. His port slipped and he needed another op to repair it a few days after it was inserted. Sebastian became more unwell and came down with the hand, foot and mouth virus. He was put in isolation for eight days. In October 2015 (Sebastian was 18 months old) we were told the outcome of the biopsy. We’d already sensed he had cancer and it was confirmed that he had cancer of the bowel. Sebastian’s cancer is known as botryoid embryonal rhabdomyosarcoma of bladder and prostate. We were relieved to be told it hadn’t spread and was treatable. The hospital was fantastic – they treated his pain with regular pain killers and bladder spasm drugs. They inserted a nasogastric tube so that Sebastian could have his meds without a fight. Sebastian had more scans and then the chemo started. We didn’t know how he would respond. It went okay but I spent the whole three days crying because our baby boy looked so poorly. 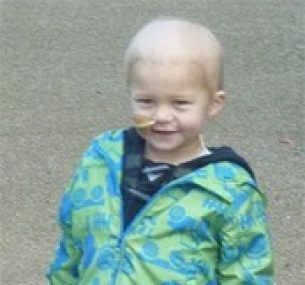 He was always such a happy lively little lad, even with this tumour inside him, but the chemo wiped him out and he slept for two days. His hair started to fall out a few weeks later and it was bothering him. So, while he slept, I sat and stroked all his hair out. It was the most bizarre thing I have ever done – removing our beautiful boy’s hair as he slept. Weekly chemo took place for six weeks and then it went to three-weekly. Sebastian suffered some infections because of his catheter, so we spent most our time at the hospital. 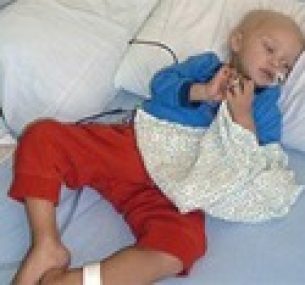 He has had many transfusions, both blood and platelets, and has to have daily injections if he is due a scan or surgery. 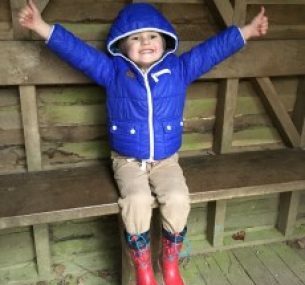 When we are home, and his neutrophils are high, we have some lovely days out to the farm or park or garden centre. 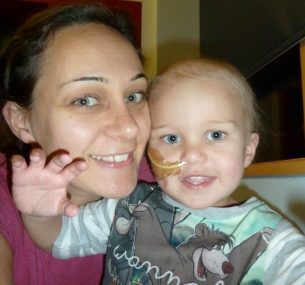 Sebastian has a long road ahead of him with surgery, radiotherapy and then more chemo. And then there are the effects of the radiotherapy. He is such a good boy with a loving smile. He is getting us through and keeps us strong. He really is our superhero. Everyone says ‘I don’t know how you cope’, but it just becomes routine and a different way to live life. Yes, at times it is really upsetting seeing our boy in pain, but we know it’s not forever and that everyone is doing their best to help him make a full recovery. We cannot thank all the professionals caring for him enough for saving his life. 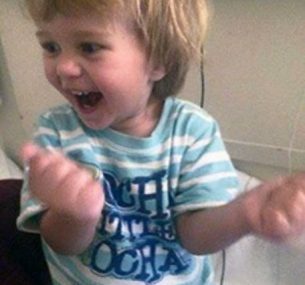 The family has pulled together – sometimes it is tougher for them because they don’t always see Sebastian when he is happy and laughing and sharing his love. Sebastian is now back at nursery and pretty much living the life a 2-year old should be living. He is very cheeky, happy and although we still suffer sleepless nights due to the pain from chemotherapy, he is well on the mend and eight months in remission. 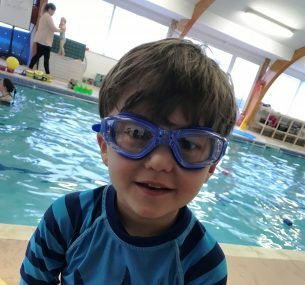 He is now nearly four and has been off treatment since May 2016. 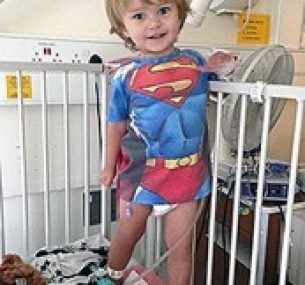 He has five monthly cystoscopies and biopsies taken if needed at Great Ormond Street and four monthly MRIs at The Royal Marsden. We also attend our local hospital with to see our renal consultant as Sebastian now has side effects from chemotherapy and major damage to his tubular function from kidneys to bladder. His tubes have been damaged so badly by chemo so now they leak protein into his body which will probably result in kidney failure at some point. So his levels of a certain type of protein in his urine are 17,766 instead of around 0-40. So extremely high. They aren’t really sure what the long-term effects will be of this but he is now on medication for life due to this. He has to have bladder function tests as a third of his bladder was removed but amazingly he has been potty-trained since June 2016. However has to go to the toilet much more frequently than others. Compared to what we were dealing with this is so much easier. The worry of cancer never goes and whenever Sebastian says he has tummy ache, I panic but I guess the longer he is in remission the easier it will be. The costs of appointments; travel; accommodation; time out of work is still a strain but you just have to get on with it. Sebastian in himself is amazing and loves visiting the hospital. As he is now older, he is starting to understand more and we no longer have to pin him down for anaesthetic, blood draws or any monitoring stats which makes it emotionally easier. He loves craft, music, singing, playing sports especially swimming, football and dancing. He has a wicked sense of humour and is a happy little superhero giving us lots of smiles. Just wanted to share this, thanks to all the research we still have our bubba with us two years on. 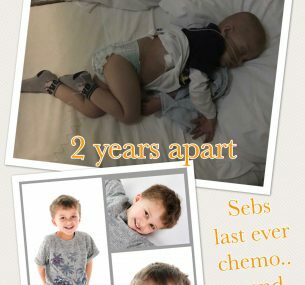 It was Sebastian’s last chemotherapy this month.